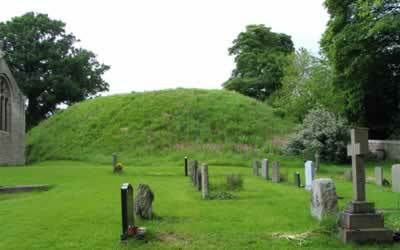 Chapel Hill is a late 11th century earthwork motte and bailey fortress, which had two main phases of occupation. Standing on high ground, against the steep slope formed by the valley of the River Lune, the castle defends a medieval ford. Excavations on the conical mound in 1904 and 1974 showed that in the 12th century, the top of the motte was raised in height. The position of the bailey has been lost but a platform to the west, which now supports the church of St John the Baptist, probably defines its site. 2 miles south is Castle Stede, Hornby and 3 miles north is Whittington Motte. Chapel Hill is located in Arkholme, off the Riverside. 11 miles north-east of Lancaster, on the M6-B6254. The site is in the churchyard and is freely accessible in daylight hours, check website for details.